The Elmbrook Church app is a great way to connect more deeply with God's Word... anywhere, anytime! The app is intended to complement Elmbrook's weekend service experience. You'll find a fill-in-the-blanks message outline, giving link, access to weekend closed captioning, calendar of events, and much more. You can also access our library of sermons from the last several months. All of the content is easily shared with others through email or social media. The weekend message is delivered automatically each week as soon as it's ready, typically on Monday. Audio and video (closed-captioned) are both accessible. Message Outline: Only on the App! The message outline for Brookfield and Lake Country weekend services can be accessed from the main window. 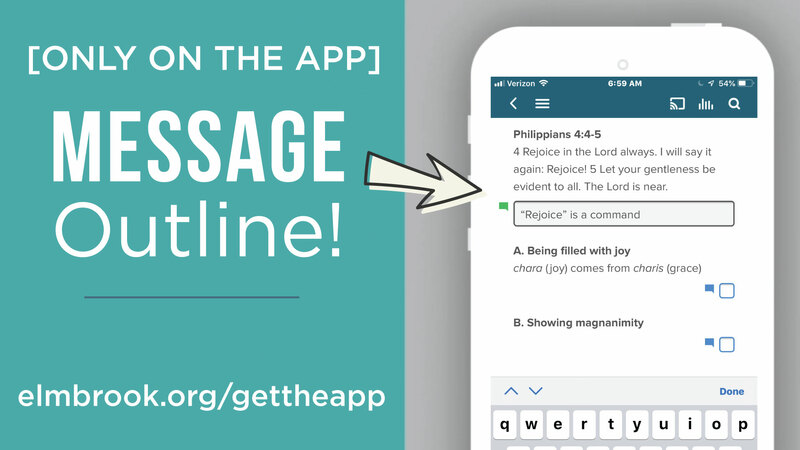 Launch the app, click "Message Outline" and you'll find the key slide points and scripture references. Type your own notes in the blue boxes, and email them to yourself when finished. The Elmbrook Church app is available free of charge for all iOS, Android and Google devices.